It’s March, and while it’s not quite time for spring cleaning, it is time to take a look at your air filter (and schedule professional HVAC maintenance). It’s important to check your HVAC system’s air filter every 30 days and clean or replace it every 1 – 3 months. You can get a sense of all the floating particulates in your air when you a beam of light cuts through the inside of your home. It’s a glimpse into another universe full of extremely small debris and microorganisms. In order to trap these microscopic contaminants and keep them from entering your lungs, you’ll need a working air filter with a high Minimum Efficiency Reporting Value (MERV) rating. A MERV 12 filter can trap particles as small as 1-3 microns (micron, short for micrometer, equals one-millionth of a meter). If you want to capture the smallest particles, such as bacteria, viruses, and mold spores, ask your HVAC technician about a higher MERV filter. Keep in mind, however, that you will need a professional HVAC modification if your air filter is too thick, such is the case with High Efficiency Particle Air (HEPA) filters. 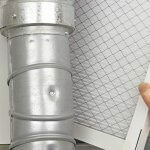 Before you purchase replacement air filters, make sure you are selecting one of the same size. 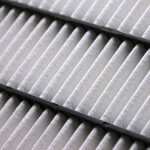 We recommend having a surplus of air filters on hand and writing the date of replacement on the filter with a Sharpie. This tells you exactly how long it’s been since your last filter change. Every 1 to 3 months is the general rule, but this will depend on a variety of factors, including the cleanliness of your home, the number of people and pets in your household, and the type of filter you have. Filters clear out allergens like dust, pet dander, and mold spores which aggravate the sinuses and collect on every surface in your home. If you’re noticing an increase in these symptoms, then a replacement air filter is a quick and inexpensive fix to solve the problem. Sometimes the return air duct is near the bottom of your HVAC unit, while other times you will find the intake air entering from the top of the unit. 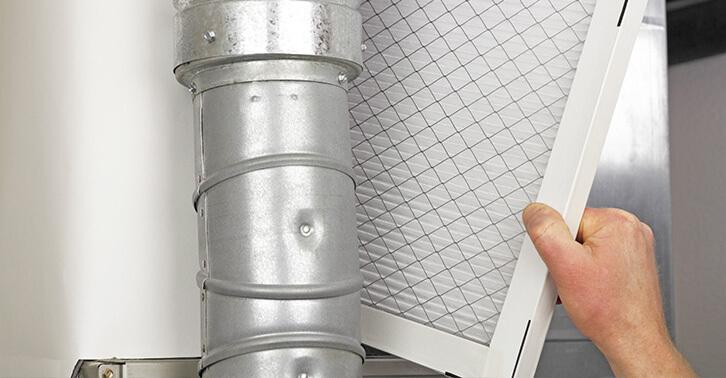 Other HVAC systems may require a filter change behind a return air grill somewhere on a wall or ceiling of the home. You may have a system with filters located behind multiple return air vents, one in each room. Second, open the storage compartment. Usually a simple grate, some systems have a slide tray positioned above or below the furnace. Open the tray and slide out the filter. Examine the filter. Does it look dirty? Chances are if you’ve answered yes to any of the three problems in the previous section it will. Try holding the filter up to a light source and seeing if light can pass through. 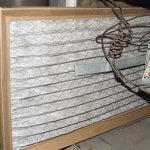 If all or most light is blocked, then you have a clogged air filter. If you look on the frame of your air filter it will tell you what size you need to replace it with. Buy a Replacement Filter. Once you’ve matched the correct size, all you need to do is select the kind of filter you want to replace it with. The most inexpensive is a simple fiberglass filter. These are the fibrous, usually blue, filters that are commonly purchased for homes and apartments. They do the job, but they do little to improve the quality of your indoor air. If you’re susceptible to allergies or have pets, consider upgrading to a polyester or pleated filter. They cost a little more but they’re much better at filtering out contaminants than a simple fiberglass filter. Replace the filter. 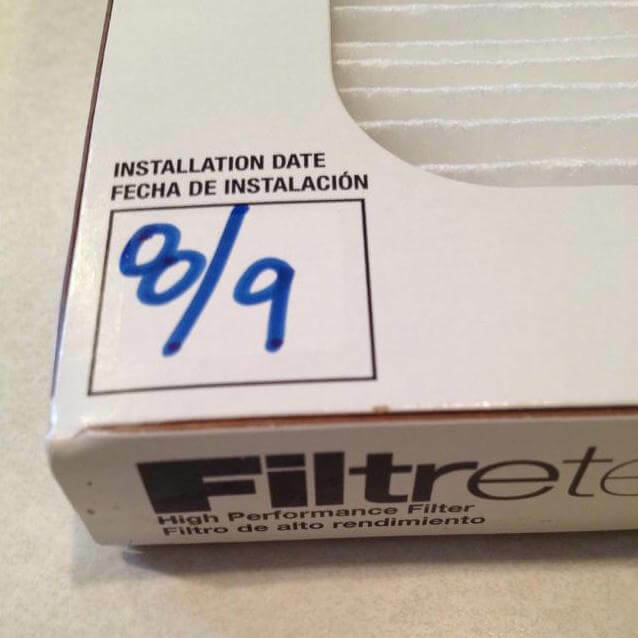 It’s a good idea to write the current date on the frame of the filter, that way if you forget to replace it, you’ll know when the last time you replaced it was. Once that’s done, insert the new filter into your ventilation system. 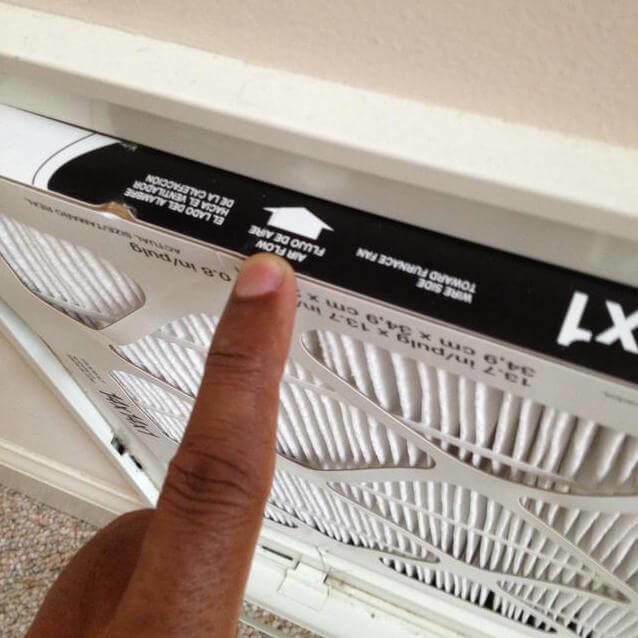 Make sure that the arrow on your filter’s frame (usually a solid black arrow) is pointing toward the furnace. Filters are a single-direction system, meaning that if you install the filter reversed, you’ll make it harder for your system to function. Close the tray or grate. And that’s it! Your filter has been replaced and you’re ready for clean air once more. One last point: if you’re still seeing lots of dust or experiencing heavy allergy symptoms, have your air ducts inspected. Filthy air ducts can stir up just as much dust as a bad air filter (and running a filthy air filter for too long can fill your ventilation system with dust). 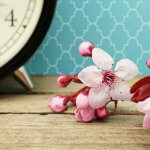 Don’t forget to schedule your spring air conditioning tune-up! Professional spring HVAC maintenance will prevent unwanted breakdowns, extend the lifespan of your system, lower energy expenses, and improve indoor air quality. For a limited time, we are offering a precision AC tune-up and safety inspection for only $68!